I founded Wiley Brothers, a leather handcrafts company specializing in leather belts and accessories, in 1999 along with my brother Peter. Our Anglo-American heritage and involvement in equestrian traditions inspired us to create artisanal leather goods, applying the aesthetic and craftsmanship of fine equestrian tack and harness to our own belt designs. We have built our products around a material with which we have been well acquainted since our earliest years, English bridle leather. We grew up in rural Virginia on an active horse farm, where we became involved in equestrian activities at an early age. On the Wiley farm, we experienced daily interaction with horses and the specialized leather goods that go along with them. Training, conditioning and competing horses bred a deep appreciation for the look, smell, feel and incredible durability of English bridle leather. Today this is the material at the core of all Wiley Brothers products. The leather we use is tanned and hand-curried in England. It is produced using traditional and natural tanning methods that employ vegetable tannins such as Sumac, Chestnut and Oak. The resulting leather which comes in ten luxuriously rich colours, is both sturdy and beautifully finished. Wiley Brothers products are artisan-built in Charlottesville, Virginia. We start with large hides which we then “strip” into belt lengths. This is only the first of the fourteen steps required to make a Wiley Brothers belt. The ends are shaped, split and punched. Edges are beveled and dyed and finally burnished with wax on a burnishing wheel. The buckles and keepers are stitched on by hand, with an awl and wax coated thread. Hand stitching is a time consuming process rarely found in leather work today, but for us it is a point of pride that sets our belts apart from the rest. The last step in creating our artisan-built products is the buffing of each finished belt with soft shearling lamb’s wool, to a soft, even sheen. 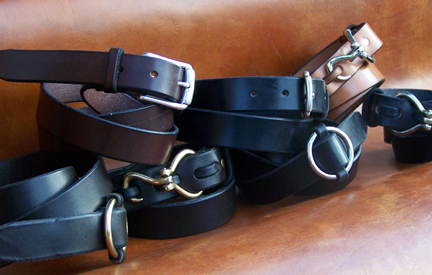 Our belts and accessories are studies in simplicity, elegance, quality and functionality. They are designed and crafted to stand the test of time. When it comes to making a quality product, we at Wiley Brothers feel that compromises are unacceptable. Our products reflect our appreciation that the finer things in life come through vision, patience and attention to detail. We hope you will enjoy how this sensibility finds its way into every belt and accessory we make. Our classic 4-loop hoof pick belt is our signature. Folding brass hoof picks, used by all types of equestrians, also happen to work very well as belt buckles. The buckle is hand-stitched to bridle leather and hooks into one of four loops. Available in all colors and sizes 26-47 odds and evens.